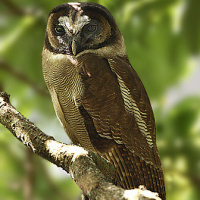 The Brown Wood Owl is a medium-sized owl with no ear-tufts and generally warm brown plumage. Typical call (including pre-call) - India. © Bruce Marcot. 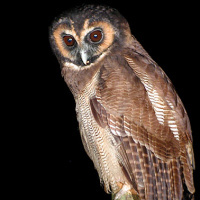 Description: The facial disc is fulvous or rufous-brown with a narrow but distinct black rim, and a blackish zone around the eyes. The eyebrows are whitish-buffish or pale orange-buff. Eyes are dark brown. The cere is bluish-grey and the bill greenish-horn with a bluish base. 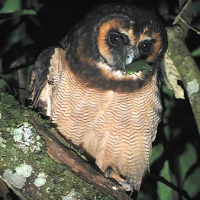 The head is blackish-brown with a rufous tint, and separated from the mantle by a prominent cinnamon-buff or fulvous nuchal collar. The mantle and back are chestnut-brown, and rather densely barred dark brown to blackish. 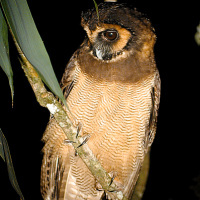 The primaries are barred chestnut and dark brown, while the secondaries and wing-coverts are fulvous, barred with dark tawny-brown. The tail is similarly barred, and tipped whitish. The throat has a narrow, white horizontal zone, contrasting with the brown neck. The upper breast has a rufous or chestnut-brown pectoral band, barred blackish or dark brown. The rest of the underparts are creamy-buff, densely barred brown. Tarsi are feathered to the base of the toes, which are pale leaden with dull grey claws. Size: Length 34-45cm. Wing length 286-400mm. Tail length 151-299mm. Weight 800-1100g. Females are larger than males. 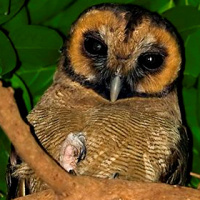 Habits: The Brown Wood Owl is a shy, nocturnal bird. 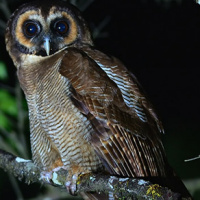 Roosts during the daytime in a dark, densely foliaged, often rather lofty tree. 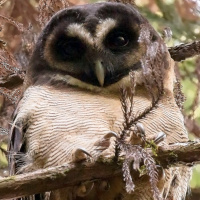 If disturbed at roost, this owl will compress itself into a shape resembling a stub of wood, while watching through half-closed eyes. If this fails, it will fly off silently. They are particularly vocal on moonlit nights. 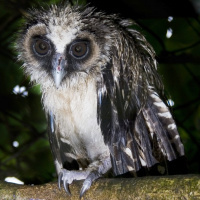 Voice: The song of the male is a single hoot, quickly followed by a vibrating note which lasts about 0.75s - "who-whoowwwwooh". This phrase may be repeated at intervals of several seconds. There is also a tri-syllabic phrase "who to-whoowwwwoh", with the first note very faint. Hunting & Food: Feeds on small mammals such as rats, mice and shrews. Also takes small birds, frogs, and reptiles. Fish have also been reported. Breeding: Little known. Breeding season is January-March in southern India. Nests in a tree hole or the hollow of a forked trunk. Normally 2 eggs are laid, averaging 49.9 x 44.1mm. Habitat: Heavy tropical forest along the sea coast, in lowlands and in lower hills. Lowland primary forest in the Sunda region. Ranges from sea-level up to about 500m elevation. Distribution: Peninsular India, Sri Lanka, southern Burma, southern Thailand, Malay Peninsula, Sumatra, Belitung, Nias Island, Mentawai Islands, Banyak Islands, Borneo and west Java. Status: Rather rare, but locally not uncommon. Original Description: Temminck, Coenraad Jacob. 1832. Nouveau recueil de planches coloriees d'oiseaux, pour servier de suite et de complement aux planches enluminees de Buffon: livraison 89, pl. 525. Page by Deane Lewis. Last updated 2017-04-04.